Here's wishing all of you a beautiful night, and Happy Holidays. 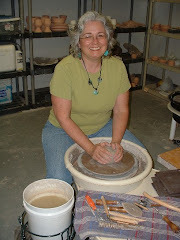 I am taking a pottery break from now until New Years, then have a show scheduled in Mississippi in January. We'll see what gets blogged during that time, but I will be checking out all your blogs to see what you've been doing. Well, here it is, Pat. Hope you like it! Will see you after the holidays. Fired version of some of the little candy dishes/trays I am making. These have small feet to elevate them off the table. I suppose you could use them for soap dishes and candles as well. This is a white clay body with dark slip painted for the vine design. Book for inspiration for these. Working on water and pine images. Drying version . Brown clay with white slip background, cobalt slip for water, green wash for foliage and dark slip for pine needles. I was so pleased with these in the greenware state. Hope they meet my expectations in the glazed. This is an "S" shaped form in the series I have started. I cut out all the body pieces at once and am working on them individually. Plastic boxes keep the other pieces damp until I can get to them. They take a fair amount of time to assemble and then I always "fool" with them until I say ENOUGH. This one got feet which I do like. I did cut outs rather than braided lattice. This is the one I finished yesterday. You can look back at the last blog and see the sketch. It definitely changed in the process. I have used a white clay and a brown clay. When Jim walked into my studio, his comment was "Nice boat". It was looking rather steamboatish to me at the end and I am trying to figure out why, because that wasn't the intention. Looks like I will be working on more of these to figure all of the changes out. I have one more body form cut out and then I want to throw some quick things to balance all the labor of these pieces. These are some sketches I have made on these container forms that I want to make. I want to do a series of them, using different colored clays, making pairs, one of which is convex and the other is concave. Texture I decided to apply to the first piece. spouts--wanted a thin, torn edge look but was uncomfortable that they would be too fragile in real life. I'm not satisfied with these, but I think doing more will help me figure a way to come to terms with the idea in the real world of hauling big pieces around. angle of cut opening--I just need to figure this out. The curve of the piece makes it difficult to match the angles. The size of this piece is about 21" long and 6.5" high, not including the spouts. I like the opportunity that posting this offers me to look at the changes I made in the making process. Braided baskets and trays from the last firing. I was perusing blogs and came across this great source of pottery images. Turns out it is by an instructor at UNC Pembroke. It's called clayglazepots' photostream. Some eye candy for your Thursday. The clay that has been sitting in my car will have to exit today, despite the rain, because temperatures are predicted to get down in the freezing ranges. So, I'll be moving clay into the studio. Unloading 2 kilns and loading a bisque or two. Maybe getting back to the bottle forms that I started on Tuesday and had to store in a plastic box because there was no time to finish. On the literary front, I have been interested in haiku poetry (maybe for using on pots, plates, platters, etc--it's always about the clay somehow. Maybe we should start a new twist on the Seven Degrees of Kevin Bacon, calling it Seven Degrees of Clay?) and got a book at the library. My faint remembering was that there were a set number of syllables. From the book I got that there were 17 syllables. Traditional pattern of 5-7-5 in three lines is what I remembered from school. This book said that there's some variation on this and it seems ok to just end up using a total of 17, breaking up the lines as needed. So, here is one. It is about one of the greatest (my opinion) inventions of the modern age--hot shower water. These are some images of work at the open house this weekend. Thanks to all the folks who came out! It was great to see people that I hadn't seen in a while and to meet all you new folks. I have just been catching up with all the blogs out there to see how everyone has been doing in the pottery world. I still think this internet is an amazing thing. Someone that I hadn't seen since college was able to find me via our Art Guild and send me a shout out. This week will be devoted to finishing up orders and working on a proposal for a new piece in the spring. I'm very excited about the idea of doing an exclusive, limited edition order, so I hope it all falls into place and my prototype and proposal get accepted. You'll hear it here first, if it does. I've also been thinking about some new bottle forms and got a couple of dishes with little feet done in a slip decoration. Some images will follow. This part of the year is when I really ruminate on new things I would like to try. There will be Treasures of the Earth in Shelby at the Cleveland Co. Arts Council, and I like to introduce new work there and at our Guild sale in May. Hope your Monday, Monday is good to you. New work coming out of the kilns all the time! Hand Crafted Work in all shapes, styles and prices! What I saw when walking in the woods. What you will find when browsing through the studio. This is a little kiln filler that I used to test an overlap of two glazes. Green plus red makes purple in my glaze universe. How could this be, you say? Well, the green glaze does have some cobalt in it. I tried a blue and red combo first, in case you were thinking I started off doing things the hard way. Apparently the cobalt in the blue glaze was too strong and pretty much just looked blue in the trial. These are also kiln fillers, original red at left, green at right. In between you see a red variation at middle left, which was taking the red, adding some clear and adding some very pale light blue in the hopes of a pink. Needs more work. At middle right is the liquid combo of the green and red glazes. On the leaf above I simply dipped one glaze, then overlapped the second. Here I have taken a small portion of green and mixed an equal portion of red. This method makes for lots of small containers all around the studio. Good labelling is essential for recreating your experiments using this method. I will try adding just a bit more red. I haven't gotten the color I want yet, but this is the closest I have come to it so far. This is a shot of the 30 small bowls that went out of the studio for an order this week. I did a little color enhancement to the image so they are not this VIVID. A view from up above Lake Lure, hiking a trail we found about 5 years ago. Nephew Jeremy is playing King of the Mountain. We spent time with my sister, parents and one of my nephews and his friend Alyssa. There was still some lovely color but just not much of it. The day after this was taken my snow crazy family drove north to around Bakersville to see the snow and tobaggan. I had to head back home to finish work. They were thrilled with all the white stuff. Yesterday one of my favorites left the gallery for a new home where it would be displayed and enjoyed for what it was. Sculpture. No function needed. The new owner asked me how I felt about it going away. I said that I enjoy making things that others love and will find a place for in their home but that's only part of the story. When I stopped and thought of the other pieces in the series that have found homes over the years, it made me glad. I know when I make these that it will take some time for them to sell so more than likely I will get to live with them awhile. Yet I still continue to make a very limited number of them, understanding they are for a few select folks who will find their way into the gallery and discover them. I guess I realized that those sculptural pieces started out being made strictly for me. They are an urge to bring into the physical universe an idea that has delighted me. Then they become the idea itself, a complete whole thought and I move out of the equation. In that, they are different than my pottery, because my urge to create functional work is dual--creating shapes that delight me but for others who will find them beautiful and useful. I know this sounds jumbled and may even fall under the category of "artspeak" which I really hate. Just some rambling around trying to pin down the whys of what motivates me to make certain types of work. Enough thinking, it's time for a little doing.... have a good day! Man, you know your pottery! Oh, you, Ron Philbeck. You cast a doubt in my mind when you said you didn't recognize that pot on my ledge as yours. And YOU WERE RIGHT! I had to give it a good look after I read your comment and scrutinize for a mark. It is a Michael Hunt pot. I think. It's got a lower case h with an oval around it. And it has ash on the top, which should have been a clue, too, since you were firing in gas for those others! What can I say except a potter knows their pots like a mama knows her kids. The ledge over the kitchen sink. Left, Mr. Philbeck again! Gosh do you think I have a lot of his pots? This jar holds my scrubbies. Various bowls in the garden window, very handy for veggies and salads. A gargoyle my daughter made at school many moons ago. My "2nd" teapot that I steep tea in. A saki bottle by Kent McLaughlin (I think? I bought it with two sweet little saki cups at the NC Potters Conference several years ago.) displaying just a few flowers to brighten my morning. This is a little scene in my dining room. On the left is a saggar (a container used to either protect pottery from ashes, etc. in a wood firing or used to contain combustible materials and a piece of pottery within it, so that it doesn't affect the other pots surrounding it) which I made at Penland. It was only fired one time. I'll have to post a picture of the little sculpture that was inside of it later. On the wall you see some boxes I bought from a clay artist at the ACC show in Charlotte a couple of years ago. Sorry--no name. Ron, do you remember who this was? The other two pots are mine, one from Penland and one with a glaze I was testing and really loved. The leg broke a bit so I ended up keeping it. The photos are shots I took when we visited Arizona and New Mexico several years ago. So, as to usage: Mostly these just sit looking peaceful and giving me enjoyment. Obviously the Penland pots have some wonderful memories. The vase holds flowers, but only on special occasions. The saggar and the covered jar can be used to secret items away. In my case that is usually candy that I am trying to hide from Jim. I will surprise myself when looking into things. Last week I found some lovely little Hershey treats when I picked up a box by my bedside to dust. I think they were back from Easter. Sometimes the hiding gets so good that I can't find them! Now, this could probably lead to more posts on the different ways people like to experience things, especially food, but my brief observation is that a person who wants to savor treats and just eat one or two at a time usually ends up with a person who likes the idea of banqetting-everything on the table for consumption NOW! Thought I would celebrate and illustrate how pottery can fill your life with pleasant moments. This is a little "still life" at my kitchen table. You see a Ron Philbeck covered jar at left, sitting on a tray by an artist from Colorado, next to a flower filled vase I made at Penland School of Craft, next to a square vase by Ron, which I use for napkins or flowers. The teacup, which is filled with Earl Grey is by Tiffany Owensby. I have a few more pictures like this that I will share over the next few entries. Apologies to those that I can't make out or remember the names of the potters! Your work will have to speak for you! It was really great to see all the folks who stopped by the booth at the Carolina Pottery Festival, admired new work and bought gifts for themselves and others. Thanks! It was great to see you. I'll be hanging around with some of these cute little guys if all goes well in my super duper kiln "oven"
Seriously, this is the name of a species of fish that lives in lochs in Ireland. I had to start with this just because of the name. Above is the book on trout that I got in Asheville. I found a form that I thought would work for a platter/wall hanging, and made a paper template for the fish. Second shot is the piece slumped into the form, with supports under head, tail and fins. The third shot is a detail of the features and a little texture. This will be in my brown clay, so the colors will be earthy and subdued. I have already loaded the dried version into the kiln for bisque fire. It was a tight fit but will shrink enough so the glazed version won't be touching the kiln walls. If I like the way these turn out, I have plans for other versions, perhaps in the white clay, which will give more vibrant color. Well, it is officially less than a week before the Carolina Pottery Festival. I have a few loose ends organizationally left to tie up, such as getting the programs, tickets, booth signs and name badges printed, and we have a walk through meeting at the location on Monday but in seven days the Board of Directors will be on the other side, thinking about what to do differently for the 9th Festival. Today I worked on getting my last pieces ready to fire before the big day. You'll see gingerbread men and some fun ornaments, more handmade buttons and hopefully some gorgeous slip painted work. As well as all the other carved pieces, functional work, leaf trays, etc. Anyhoo, come on down, over, up, across, by foot, by canoe, by car......and bring some friends. This is one of the pieces I threw while at the Fair at the beginning of this month. It is a vase with four Koi fish carved in a water pattern. You are looking at the head and body of one of the lower ones. 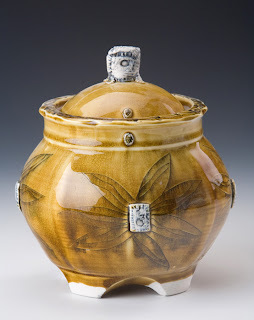 I use a brown glaze that is brushed on over the carved areas, then sponged off. Then a dip into a light blue glaze. That is followed by brushwork with an orange glaze over the fish bodies. You can see the iridescence that happens when the overlapped glazes pool. The blue glaze is fat and creamy, with tiny bubbles under the surface that reflect light. I think this is as close to a Chun glaze as I will be able to get with the way I am firing. One of the descriptions for a Chun glaze is "a milky, opaque finish where tiny bubbles are clearly present"
Sometimes you are asked to do "odd" jobs because you have artistic tendencies. A lady contacted me back in the summer about "fixing" a crucifix for their church. I told her I would be happy to look at it and when she brought it, it was in a box that was 40"x48". It was a turn-of-the century statue that had been removed from it's cross for cleaning, gotten left outside and the arms and legs had broken off. They had already had it repaired and appendiges reattached, but wanted more color and detail added to the plaster work. I said I would try, did a bit of research on the internet and became terrified that I would mess up the restoration work if I "fiddled" with it. So it has sat, awaiting a return of courage. On Monday I darkened the skin and added facial detail and toned down the hair and beard. Yesterday we moved the statue out of the studio and on the road back to the cross and display in the church. It's funny sometimes the things you are asked to tackle, isn't it? No, it's not functional pottery, but it is something that definitely has a function and purpose and now it is going back to it's "use". These are a few shots of the pierced flower vessels, more of the slip painted trays and some of the new combos of warm glazes all grouped together. Today I will be glazing work from the bisque kiln, which is more of the slip painted trays, using different slips, underglazes, etc. for more color. We were in Asheville this past weekend and I had a chance to roam the aisles of Highwater Clay and visit some fun places. I got lost looking for Piedmont Paper, which is a distributor of packing materials and boxes, and turned around in the parking lot of The Screen Door, which was well off the beaten path. It was an enormous building divided up into vendor areas, so there were a lot of antiques, artist work, and some stuff that some people might term "junk". I got caught up looking at old wooden circles, blocks and spindles, wondering what I could use them for but was able to pry myself away to visit the large book area. Sorry there are no links for you, but I am very short on time this am. I came away with a copy of Pioneer Pottery by Mick Cardew and a book by Richard Zakin that highlighted 36 potters, one of which was Bruce Cochrane. Of course, there was more--a book of beautiful watercolors of fish, an art deco decoration book and a book on making musical instruments out of gourds. Even though the gourds, fish and art deco don't seem to have anything in common with pottery, there is actually a theme. I want to make some musical instruments EVENTUALLY out of clay and this book was a jumping off point. I also want to do more fish decor inside of some platters, so inspiration was needed, and I want to make stamps for texture and saw some good things in the art deco book. And you just thought I had a book compulsion! Well, you're probably right, but it's important to justify your purchases.......Off to check the kiln! These are a few shots of the area around Gatlinburg, TN about a week or so ago. I met my mom, sister and friends for a short visit and it was really beautiful up there. Fall color was just beginning to turn. It was a great little rest and calming experience. Of course I laughed until my sides hurt, just as I always do when my family gets together. Thanks for coming out to the open house! Just wanted to give a quick thanks to all the folks who came out to the open house. Jen's work was beautiful and got many compliments, as did Susan's hand knit pieces. I wanted to thank them also for their great work. Susan will have her work in the gallery where you can admire and purchase it if you missed the weekend event. Jen will be at the Carolina Pottery Festival in Shelby on Nov. 8, sharing a booth with Ron Philbeck, and at the Carolina Designer Craftsmen event in Raleigh the weekend of Thanksgiving. Here's the post card for the Open House this weekend! The studio is almost all cleaned. New fall flowers are planted. Empty space is awaiting the arrival of Jen's pots this evening. 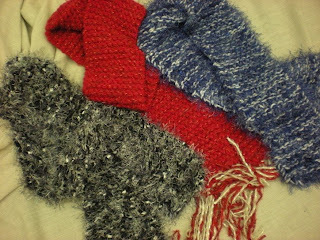 Susan's scarves are here and look great. Gurley-Girl Knitting at Open House! 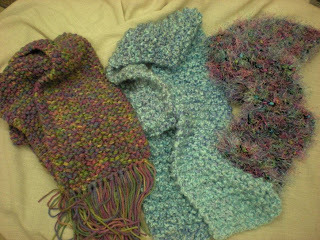 Preview of the hand knitted scarves for gals and guys by Susan Gurley. They range in price from $10 to $41, depending on the detail and thread used. You can even get her to create a unique piece of wearable art in your own colors! 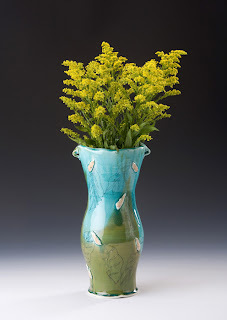 A couple of beautiful pots from Jen Mecca, who will be my guest artist on Oct. 18 and 19. The details in her work are incredible and I love the whimsy and joy with which her pottery is made. I was up in the mountains last week and came home to beautiful weather for the Claymatters sale. Really enjoying this Indian summer. Today was a slip painting day and a tile painting day in order to fill the bisque kiln. Bamboo and pine trees are the themes I have been working on. Tomorrow I will have some pictures of Susan's scarves and more pottery. See you then! Hope you can make it out for the fall Claymatters Sale on Oct. 11, from 10am to 4pm, at the McAlpine Business Park on Monroe Rd. in Charlotte. It will be a great day! See you there. These are some of the new things I have been working on that will be at my open house on Oct. 18 and 19. I'll have Jen Mecca's pottery and some handmade scarves by Susan Gurley. Keep watching and I will have some photos of their work posted soon.